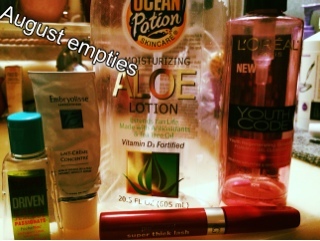 I didn't have too many empties this month- but they were all good and a few are staples in my summer and make up routines! 1. 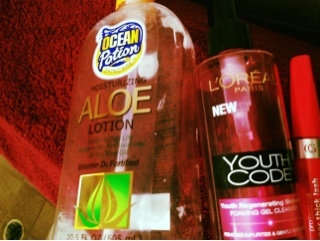 Ocean Potion Skincare Moisturizing Aloe Lotion: I love this stuff and purchase it every summer. I'm not sure but I think this is only available (I purchased mine at Walmart) during The summer. It smells so good and it feels so good on the skin, whether you've been in the sun or not. The products states that it is," formulated to replenish and repair skin cells after exposure to the sun and all other outdoor elements". This is a perfect description- my skin feels naked without it during this dry, hot weather. Contains Aloe Vera, Tea Tree Oil and vitamins A, C & E- all great stuff! Repurchase: Yes! 2. L'oreal Youth Code Foaming Gel Cleanser: I purchased this while it was on sale and I had a coupon, so I think I ended up paying $2 for this. It lasted a long time. I kept it in the shower to use with my clarisonic and liked it. I really think it's hard not to get a cleanser that doesn't work well with the clarisonic. Repurchase: Maybe, I have a few face cleansers to last me a while. 3. 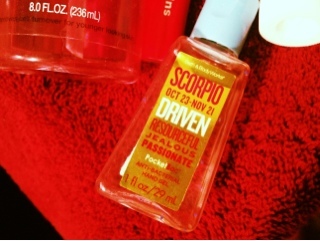 Bath and Body Works Anti-Bacterial Hand Gel: I bought this particular one (it has my Horoscope-Scorpio) during one of their sales and as always- I love B&BW anti-bac hand sanitizers. Repurchase: Have a few back up of different scents! What about Embryolisse? Is it expensive? I wanna try cover girl! No definitely not bad at all!! 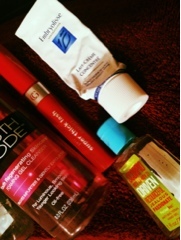 Especially compared to me, who didn't finish a single product :/ fail! Thanks=) I am using every bit of my stash as I'm currently on a no-buy (not by choice).